A second icebreaker had to come to assistance as two vessels loaded with ten thousand tons of goods were making their way from Arkhangelsk to Pevek. The vessels «Iogann Makhmastal» and «Sinegorsk» on 7th January arrived in the Russian eastern Arctic port of Pevek. 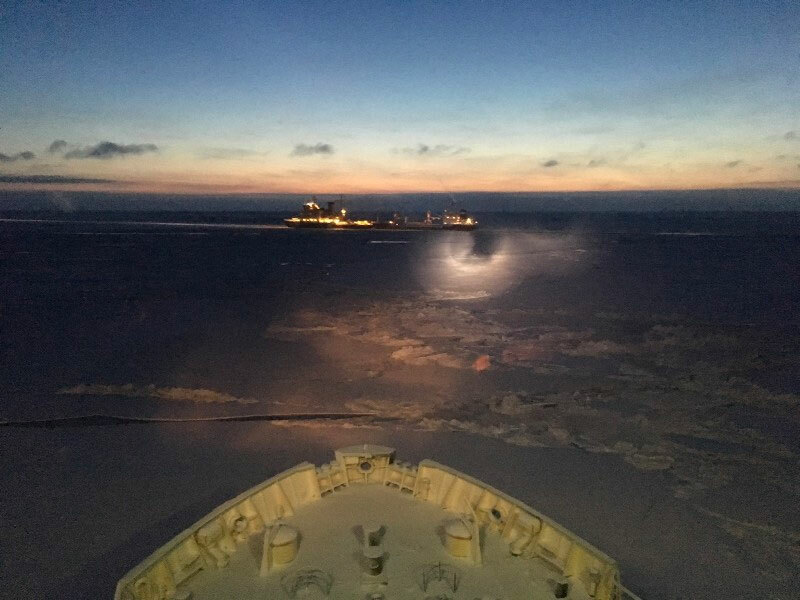 It is the first time ever that icebreakers have escorted cargo vessels from the western part of the Arctic to Pevek at this time of year, Rosmorport, the federal port company, informs. The shipping operation was not an easy one. Accompanied by icebreaker «Kapitan Dranitsyn», the two vessels set out from Arkhangelsk on 14th December, and were originally due to arrive in Pevek on 30th December. However, ice conditions were difficult and a second icebreaker, the «Admiral Makarov», had come to assistance. The 36,000 horse power «Admiral Makarov» made it to the convoy on 28th of December, the regional government of the Chukotka region informs. It was then located in the Sannikov Strait by the New Siberian Islands. The «Admiral Makarov» is normally based in Vladivostok. The «Iogann Makhmastal» and «Sinegorsk» carried about 10,000 tons of construction materials for the new port infrastructure in Pevek. The east Arctic town will in year 2019 be the site for Russia’s first floating nuclear power plant, the «Akademik Lomonosov». The arrival of the vessels is a major event for Pevek, regional Governor Roman Kopin says. «It is a big event, because it allows us to continue construction works in this very important project, […] and because it shows that Chukotka is ready to serve this Arctic highway all year round», he underlines in a press release. «Perhaps, in the future, we can stop being dependent of the navigation [ice-free] period». According to the governor, the ground works with the protection dam around the power plant is 79 percent finished, while the coastal fortification works are 56 percent completed. Several unique shipping operations are taking place this month. On January 4th, a ship owned by ZPMC Red Box Energy Services, a Netherlands-based marine-transport services provider, made it to Sabetta, the new Russian Arctic port in the Yamal Peninsula. The ship became the first cargo vessel to sail heavy construction modules along the Northern Sea Route during the winter months, the Arctic Journal reports. The ship departed from Qingdao, China, in November, passing first through the Bering Strait, and then westbound along the NSR, where it was escorted for part of the way by Russian icebreakers.